West Bromwich Albion head coach Tony Pulis has spoken with James McClean after the player refused to acknowledge the British national anthem. Republic of Ireland winger McClean, 26, bowed his head and turned away from the English flag before a friendly on the club's tour of the United States. "I had a chat with him and explained what we do as a club," said Pulis. "He's got to turn towards the flag like everybody else has and he recognises that," he told the club website. McClean's gesture came before Albion's game against Charleston Battery on their three-game pre-season tour. Afterwards he wrote on Twitter: "I don't need to say anything or will I either." Pulis added: "He thought he was OK to close his eyes and put his head down in respect of both anthems. The trouble is he's got to face the flag." McClean took advantage of the rule that allows anyone born in Northern Ireland to choose which national side to play for, as long as they have not taken part in a competitive senior international. He played for Northern Ireland at under-21 level but opted to represent the Republic of Ireland in 2011. The Londonderry-born former Sunderland midfielder has previously refused to wear a Remembrance Day poppy out of respect for the people killed on Bloody Sunday in 1972. 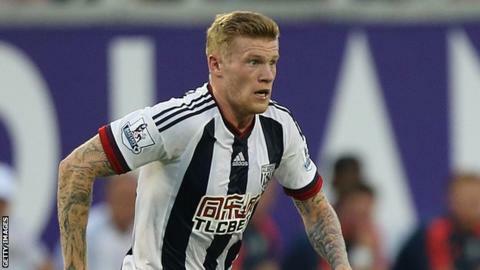 McClean joined the Baggies from Wigan in June and Pulis says he has taken to life at Albion well. "Obviously there has been a stigma around him and he doesn't need to start that up again," Pulis said. "So hopefully we've nipped it in the bud. "We've got Northern Ireland lads in the squad and he's been absolutely fantastic with them, and the way he's mixed and integrated with the group has been brilliant."